Sometimes I need to make a hat that is mega huge! There are some people out there with massive sized heads! I don’t need this pattern often but it is good to have several of these patterns for men, women, and even children. I have run across a child with a deformed head and have custom fit a Mega hat just for him. I will make this hat again in 2011 using a single strand of worsted yarn. Round 7 – 11 is where you personalize the length of the hat. Make as many or as few rounds needed so the hat is as long as needed to cover your head. This hat was made with Simply Soft Pink, worsted acrylic yarn, 2 strands held together, a size J hook, and no edging on the hat. You can use a reverse single crochet for an edging on the hat. A solid color and a variegated! A solid color and a variegated. This hat will look good in any solid color with a matching variegated! This hat was made with leftover “Red Heart” black worsted acrylic yarn, and “Red Heart “ Mexicana, and a size J hook. lighting in the house at all! The hat is made with dark green, medium green, dark red, and medium red. There are two white beads on there for the seeds or buds on the mistletoe. Sorry I don't know what they are called! I will get another pic this weekend! Round 7. Repeat round 6. Change to color D.
Round 8. Repeat round 6. Change to color A. Round 9. Repeat round 6. Change to color B. Round 10. Repeat round 6. Change to color C.
Round 11. Repeat round 6. Change to color D.
Round 12. Repeat round 6. Change to color A. Round 13. Repeat round 6. Change to color B. Round 14. Repeat round 6. Change to color C.
Round 15. Ch 1, hdc in same sp as ch 1, 1 hdc around. Change to color D. Slip st in first hdc made. Round 16. Repeat round 15. Change to color A. Round 17. Repeat round 15. Change to color B. Round 18. Repeat round 15. I looked for a free pattern but could not find one. I used the pattern in the book, "100 Flowers to Knit & Crochet"
I can one in 10 minutes or less! So simple and very easy! This hat was made with leftover Red Heart worsted acrylic yarn, a size J hook, and 18 rounds. Its NOT a mushroom hat! Jonathan said, "It looks like a vase!" He really loves this hat! Is it the top or back of hat? Most of hat behind the face. Note: For remaining rounds do not crochet to tightly, try hat on several times to make sure its not to tight or not to loose. Hat needs to fit snugly but not tight. The hat is heavy so you want a good fit! If you are making this for a larger sized head you can eliminate some of the decrease stitches in round 19. Round 22. Repeat round 20. Round 24. Repeat round 23. Round 25. Sl st around being careful not to get your sl st too tight! Another option, reverse sc around. For Your Information: This hat requires a lot of yarn! I used almost 12 ounces of one color and 12 of the other color. Please make sure you have enough yarn for this hat. I used leftovers of Red Heart, a more lightweight yarn doesn't hold its shape as well. 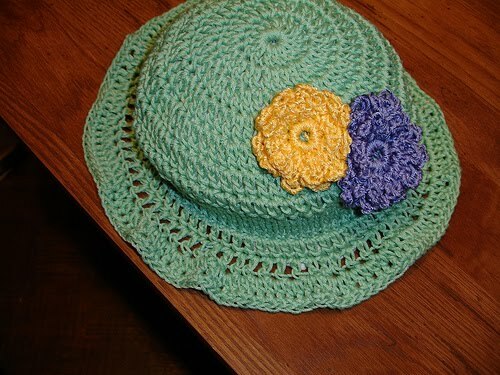 This hat is usually done in multi colors that are either very bright or muted tones. I would make this hat in black for people who held professional jobs and sometimes needed to contain their dreads for a more polished look. This hat was made for men and women who had dreads that were either very thick or very, very long! I have had someone stuff this hat with toilet paper because they didn't have enough dreads to fill it out! Crazy! Beware!!! It's coming in less than 2 hours!!! Here it is!!! The beginning of my "Dark Locks Hat"!!! This is the inside of the top of the hat! I used red and white because it is December! I can gift this to a friend with enormous dark locks! said the same thing! I was close to beating my head on my desk! It's a holiday hat!!! I will make this hat next year in rastafarian colors, the way it is supposed to be! try it in holiday colors. Rounds 9-10. Repeat Round 8. Change to color B.
Rounds 13-16. Repeat Round 8. Change to color C.
Round 17. Ch 2, dc in same sp as ch 2, fpdc in next sp. ( dc in next sp, fpdc in next sp) Repeat around. Rounds 18-19. Repeat Round 17. Round 8 is where you personalize the length of the hat. Make as many or as few rounds needed so the hat is as long as needed to cover your head. This hat was made with leftover Red Heart yarn, a size J hook.